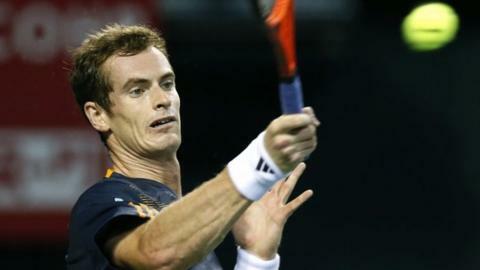 US Open champion Andy Murray maintained his impressive form in the defence of his Japan Open title with a straight sets victory over Lukas Lacko. The Briton, 25, needed only 57 minutes to beat his Slovakian opponent 6-1 6-2. Murray broke the world number 65 twice in the opening four games, concluding the opening set in 25 minutes. Lacko offered slightly sterner resistance in the second but was unable to stop Murray setting up a quarter-final tie with Stanislas Wawrinka. "I started the match almost perfect. I only lost a couple of points in the first four or five games, so that was important. And once I got a break in the second set, I started to play better again," said the British number one who hit six aces during the match. Murray broke to love in each of Lacko's first two service games to race into a 5-0 lead in less than 20 minutes. He went on to break in the third game of the second set and again in the seventh, taking all four of his break points, to serve out for a convincing win. Murray has beaten Wawrinka in seven of their previous 10 encounters, with five of those victories on hard courts. "He is playing very well just now. He had a good US Open and he also did well in Cincinnati, he made a semi-final," said Murray of seventh seed Wawrinka. "I think hard courts are a good surface for him. We had a lot of tough matches over years especially on hard courts, so I expect the same one on Friday." Wawrinka beat Jeremy Chardy of France 7-6 (7-1) 6-7 (6-7) 7-5 to reach the last eight and predicted a "tough" encounter against the British number one. "He is playing great. He won the Olympics, he won the US Open and he always plays great here," said the 27-year-old. "It's going to be tough, for sure. It's always tough to play against top-five, top-four players. You need to focus on what you are going to do and try to play your best game."